In 1306 the Order of Saint John of Jerusalem bought and occupied the Island of Rhodes. On Mount Philermos in Rhodes there were the remains of a Byzantine church. It had housed a “miraculous” pilgrimage icon of the Blessed Mother, which pious tradition accredited to having been painted by Saint Luke the Evangelist and having been brought from Jerusalem. The Knights of Saint John built a basilica on the spot and reinstated the icon, which was venerated as “Our Lady of All Mercies” and became known near and far as “Our Lady of Philermos”. Since then the Order has been devoted to Our Lady under that title as its protector and patroness. In 1530 the Order moved to Malta and the icon was placed in the church of Saint Lawrence, which soon was badly damaged by fire, but the icon was unscathed. On May 19, 1565, Suleiman began the great Ottoman siege of Malta. Although greatly outnumbered, the Order withstood the attacks. 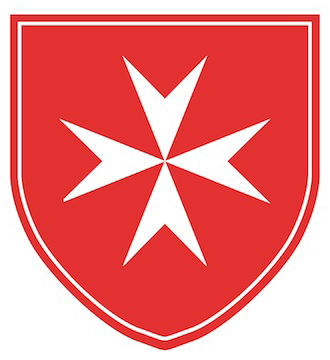 A relief army landed on Malta and the next day, September 8th, the Feast of Our Lady of Philermos, the Turks fled. After Bonaparte captured Malta in 1798, the Order took away the icon of Our Lady of Philermos which came under the protection of the Russian Tsars. It was saved from the 1917 revolution, and in 1919 was taken to Copenhagen. In 1931 it was taken to Yugoslavia and placed under the protection of the king. When the country was invaded in 1941, the icon was hidden in a monastery in Montenegro. It later was found by Tito and placed in a museum in Cetinje but was never displayed. Considered lost for some time, a few years ago the icon was ‘discovered’ and now can be seen at the National Museum in Cetinje, Montenegro. For over seven hundred years you have protected our Order, often against great odds and in the bleakest of conditions. 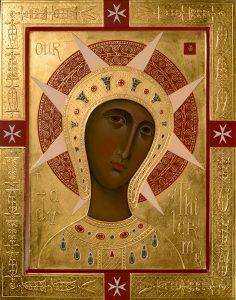 Beloved Patroness, we pray you continue to guard and guide our Order in the fulfillment of its work for the poor and the sick, and for peace, still often carried out against opposition and in dangerous conditions. Amen. This information was provided by Fra’ James-Michael von Stroebel. Click here to view the complete Calendar of Liturgical Celebrations Proper to the Order.